And as we will try to explain in a new post this weekend, there are about 9.5 million great reasons why BookBub wants readers to focus on the books that it includes in its daily ebook alert, even if you’ve never heard of them before. Amazon has done it again, and as usual, the winners are readers. We’ll be watching closely to see what new titles become available, but based on what we see already it seems likely that Kindle Unlimited will be as big a disruptive force for “business as usual” in the publishing world as the Kindle itself has been. We will no doubt continue to see misguided analyses claiming that Amazon will be competing with this, that and the other existing service, but any such “competition” will likely be akin to the centuries-old competition between the hammer and the nail: usually, one doesn’t even get to hear the nail say “ouch.” Nobody is in a position to compete with Amazon on this terrain. Amazon seems committed to a pretty generous royalty structure for enrolled titles, which we think will ultimately amount to about $2 a copy for authors who participate in its KDP Select program. 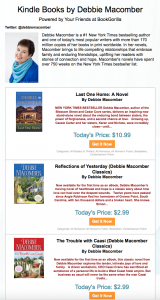 Given recent negotiations — and the Hachette stalemate — between Amazon and some large publishers, we wouldn’t hazard a guess as to what share those publishers and their associated authors might receive, but publishers who stay on the sidelines may find themselves in an untenable position — both with their authors and with their own corporate bean-counters — as the Kindle Unlimited catalog grows. For people who read a lot, Kindle Unlimited is going to be awesome. We won’t talk ourselves blue in the face trying to persuade you beyond noting that the seven very popular titles listed above would currently cost you $66.15 in the Kindle Store without Kindle Unlimited. After all, we think all of us will make better use of our time looking for great books to download FREE. It’s probably silly of us to take any pleasure in having predicted this program almost exactly six years ago on pages 90-91 of the paperback edition of The Complete User’s Guide to the Amazing Amazon Kindle, and we didn’t get it exactly right, anyway. 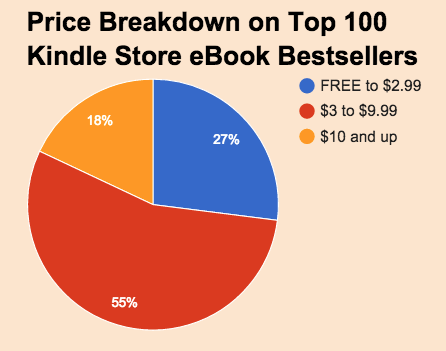 We called it Kindle Buffet, said it would be a Kindle reading subscription plan “on steroids,” and we were way off on how such an offering would be priced: we said it could cost as much as $50 a month. My, how things have changed! Start your free 30-day trial today here. SEATTLE–(BUSINESS WIRE)–Jul. 18, 2014— (NASDAQ:AMZN)–Amazon.com today introduced Kindle Unlimited–a new subscription service which allows customers to freely read as much as they want from over 600,000 Kindle books, and listen as much as they want to thousands of Audible audiobooks, all for only $9.99 a month. Finding a great book is easy, and there are never any due dates–just look for the Kindle Unlimited logo on eligible titles and click “Read for Free.” Customers can choose from best sellers like The Hunger Games, Diary of a Wimpy Kid, and The Lord of the Rings, and with thousands of professionally narrated audiobooks from Audible, like The Handmaid’s Tale and Water for Elephants, the story can continue in the car or on the go. Kindle Unlimited subscribers also get the additional benefit of a complimentary three-month Audible membership, with access to the full selection of Audible titles. Kindle Unlimited is available starting today and is accessible from Kindle devices or with Amazon’s free Kindle reading apps. Start your free 30-day trial today here. Read and listen everywhere: Access across Kindle devices and free Kindle reading apps for iPhone, iPad, Android tablets and phones, Windows Phone, BlackBerry, PC, Mac and Windows 8–so you always have your library with you and never lose your place. Amazon unveils the Fire Phone! Thousands of media, developers and real, live Amazon customers gathered in Seattle today to see Amazon founder and CEO Jeff Bezos launch the company’s latest product, and BookGorilla was there with live coverage from our friend Len Edgerly. 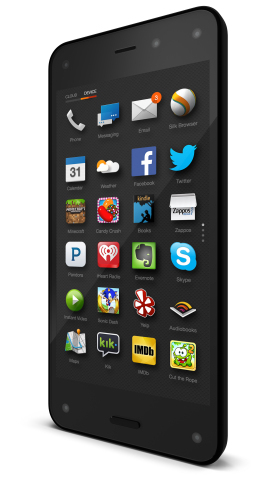 The product, as you already know, is Amazon’s brand new Fire Phone. Bezos described it, in a word, as “gorgeous,” and it is definitely going to be a game changer in all kinds of ways. We are all trying to keep up, to take in these new ways of looking at a screen and navigating a smart phone, reports Len. Make that “brilliant phone,” a new category is being presented to us today. Indeed, the Fire Phone is going to seem magical to most of us, at least for the next few months, but it’s also amazing to think that there are kids who will grow up taking all of this for granted. SEATTLE–(BUSINESS WIRE)–Jun. 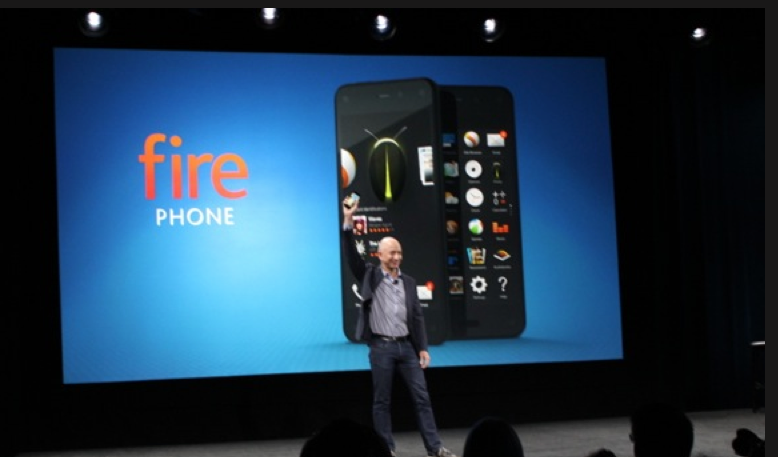 18, 2014– (NASDAQ: AMZN)—Amazon today unveiled Fire, the first smartphone designed by Amazon. Fire is the only smartphone with Dynamic Perspective and Firefly, two new breakthrough technologies that allow you to see and interact with the world through a whole new lens. Dynamic Perspective uses a new sensor system to respond to the way you hold, view, and move Fire, enabling experiences not possible on other smartphones. Firefly quickly recognizes things in the real world—web and email addresses, phone numbers, QR and bar codes, movies, music, and millions of products, and lets you take action in seconds—all with the simple press of the Firefly button. Starting today, Amazon is introducing the Dynamic Perspective SDK that enables developers to build new experiences with this groundbreaking technology. The Firefly SDK is available starting today so developers can invent new ways to use this advanced technology. Later this year, Firefly will include artwork recognition, foreign language translation, and wine label recognition powered by Vivino. Fire ships on July 25 and is available exclusively on AT&T—the nation’s most reliable 4G LTE network. Starting today, customers can pre-order Fire at http://bit.ly/32GBFirePhone. Fire with 32GB is available for $199 with a two-year contract—that’s an extra 16GB of memory for the same price as many other premium smartphones—or zero money down for as little as $27.09 a month from AT&T on Next 18. Fire is also available with 64GB for $299 with a two-year contract or starting at $31.25/month from AT&T on Next 18.